New research supports the idea that life can spread from one world to another. Two newly published papers underline how important the process of panspermia—the transport of organic material and possibly even microbes through space—is to astrobiology. The first paper, by Michel Nuevo from NASA’s Ames Research Center and colleagues, shows how DNA-related molecules (sugars of DNA and their derivatives) can be produced in space when ultraviolet light hits mixtures of water ice and methanol. The researchers found some of those derivatives in carbon-rich meteorites on Earth, which shows not only that these building blocks of life can be synthesized in deep space, but also that they can be transported to a planetary surface, where they could play a role in constructing cells. In fact, this may have happened on our own planet about 4 billion years ago. In another recent study, Martin Beech from the University of Regina in Canada and colleagues calculated the total amount of rock ejected into space from Earth over the past 550 million years. That’s when the first large animals existed on our planet, including trilobites. The calculated amount of material is staggering: 10 billion tons of Earth rocks were blasted off the surface (by asteroid impacts) with enough energy to reach Earth escape velocity and travel into space. At least some of these rocks likely contained microbes that could, in principle, have populated other habitable worlds. Experiments have shown that a fraction of microbes within a rock can survive the pressures associated with ejection from a terrestrial planet. Beech et al. estimate that two-thirds of the 10 billion tons of rock can be attributed to the Chicxulub impact that led to the extinction of the dinosaurs. 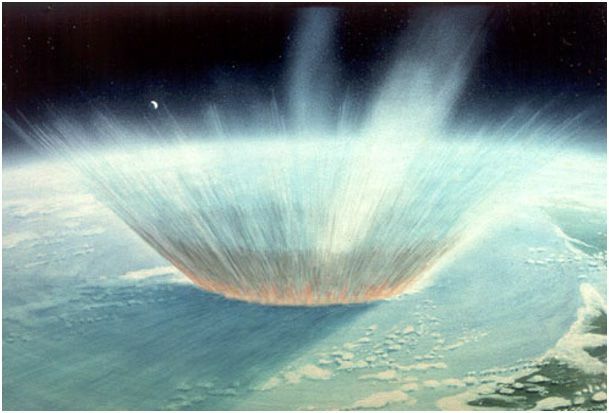 Since many of Earth’s impact craters have not yet been identified, the 10 billion tons are probably a lower estimate. Some of the ejected material likely found its way to other terrestrial planets and our Moon. An even smaller fraction would have ended up in the outer Solar System, and an incredibly tiny amount could have left our Solar System altogether. It’s unclear how this would have affected the distribution of life to other rocky planets. Mars was borderline habitable during the last 550 million years. As for the icy moons of Jupiter and Saturn, any microbe-bearing rock fragments would have had to enter liquid water reservoirs covered by thick ice, and we don’t know whether the subsurface oceans of Europa, Enceladus, Titan, and other moons even have the right chemistry to support life. Spreading life outside our Solar System would be even more unlikely, because any rock that makes it that far would be thoroughly irradiated during the long journey, and would probably end up falling into a star or wandering for eons through space rather that falling on a habitable exoplanet. Even if panspermia did not spread life to another habitable planet in the last 550 million years, it could easily have done so in earlier times, when Mars (and possibly Venus) still had oceans on their surface. If, as the work by Nuevo seems to indicate, near-ready building blocks of life are readily produced in space and distributed by meteorites, the origin of life may be quite a bit easier than many of us envision.